Our heritage collection includes all objects that were a part of or used in the Old Parliament House building prior to its closure in 1988. The heritage collection is protected by the Environment Protection and Biodiversity Conservation Act 1999. The Old Parliament House building is the prime ‘object’ in the collection. Our Collection Development Plan outlines the Museum’s collection principles and priorities. 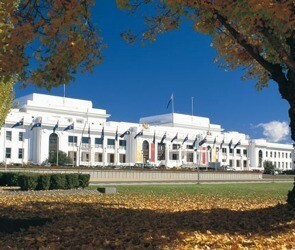 Old Parliament House opened in 1927 and served as the home of Federal Parliament until 1988. 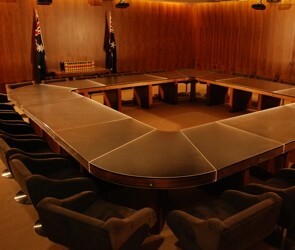 In Canberra’s early years the House was the social, geographic and political heart of the new Australian capital. Over time, this impressive building became synonymous with some of the country’s most important moments including Australia’s declaration of war against Japan in 1941 and the dismissal of Gough Whitlam’s Labor Government in 1975. The collections of the museum have unique historical value to Australia, having important associations with the processes of government, the building’s functions and with the people who governed Australia from 1927 to 1988. 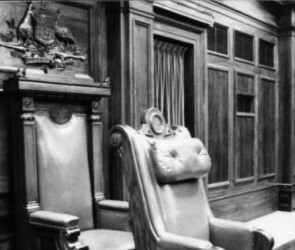 The humble chair provides a good entry point to our collections: what do these chairs tell us about Australian democracy? The legacy of the building does not just lie in the events that took place here, or in the names of the people who walked its lobbies. Every part of this building tells a story. Explore the building, its objects and its stories.